The Instep Devon Championship is a race series from a selection of Instep clubs races over the year. The list of races for this year is given in the table below. Runners have to run in at least 5 races during the year to qualify. Runners earn points according to their race position both overall and in their age category. If there are 3 or more club members running (male and female separately) in a race then the club gets points as well for the team prize. Note runners must always include their club name in their entry to ensure they are included in the Instep results. The age category for the first race in the year is the one assumed for the whole year even though they may have changed mid-year. Results for 2019 races after Fast Friday click on link here. Post a message on Instep Devon FB page if any problems or contact Roger Saunders (Honiton RC) or Tony Gale (SWRR). The ONES in GREEN ARE CONFIRMED and if you click on the race it takes you to a page with more details, THOSE IN RED ARE PROVISIONAL. please check with the race organisers for full details, instep cannot take any responsibilty for any errors in this list. (Confirmed = event & date confirmed by race organiser , TBA = event & date To be advised, tbc = date to be confirmed). Note only best 5 races count. If there is a dead heat then the athlete who has done the most races takes precedence. 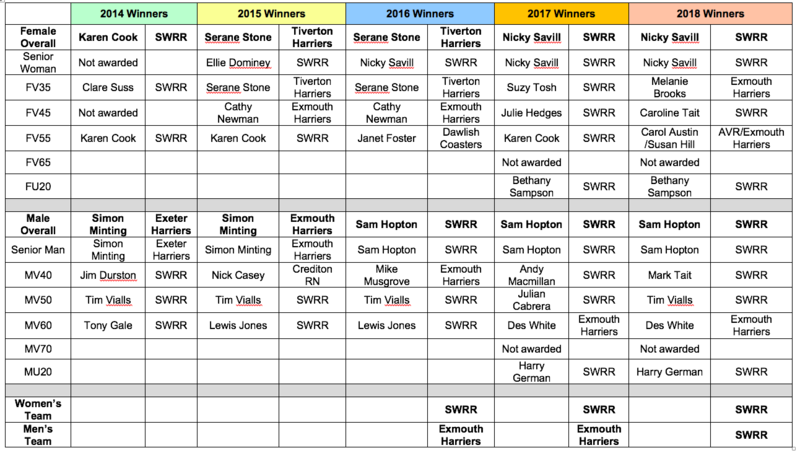 1ST - SOUTH WEST ROAD RUNNERS- 1166 pts. 3Rd - Axe valley runners - 547 PTS. 1ST - SOUTH WEST ROAD RUNNERS - 1156 PTS. 2ND - WOMEN ON THE RUN - 637 PTS. 3rd - tiverton HARRIERS - 585 PTS. 5th - Honiton running club - 525 pts. FOr Team points the FIRST 3 MALE AND FIRST 3 FEMALE FINISHERS FROM A CLUB SCORE POINTS IN EACH RACE, BEST 5 RACES TO COUNT. NO TEAM POINTS SCORED IF LESS THAN 3 club fINISHERS IN ANY GIVEN RACE. Results for previous years. full sets are at links at bottom.